Ganga Dasahara is a spiritual retreat organized by Purna Vidya Foundation. The location of the retreat is Tapasyalayam, Uttarakashi. 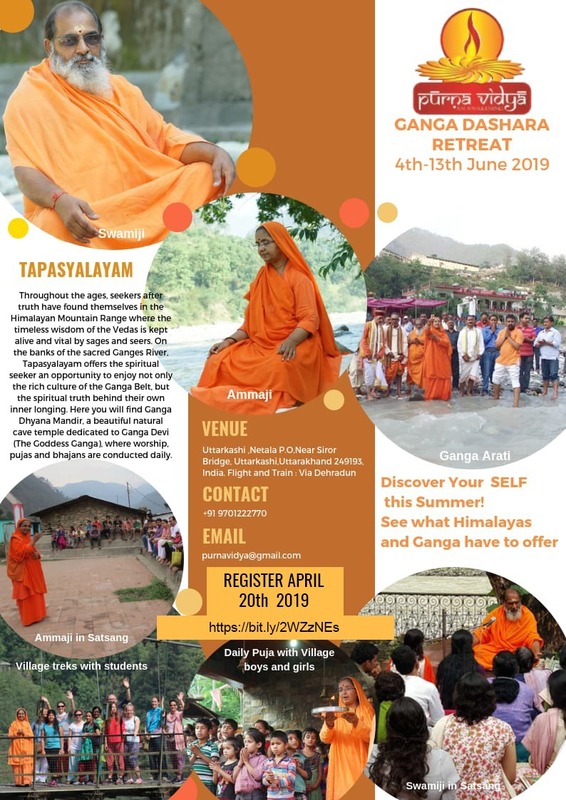 On the banks of the sacred Ganges River, Tapasyalayam offers the spiritual seeker an opportunity to enjoy not only the rich culture of the Ganga Belt, but the spiritual truth behind their own inner desires. Here you will find Ganga Dhyana Mandir, a beautiful natural cave temple dedicated to Ganga Devi, where worship, pujas and bhajans are conducted daily. This retreat will also involve a dip in the Ganga, to seek Her blessings. The retreat also includes courses on Vedic chanting, meditation and the Mundakopanishad. Other recreational activities organized are trekking and visiting some local shrines in Uttarakashi. Indic Academy will sponsor one deserving candidate to attend this program. If you would like to avail our support to attend this retreat, please fill this form.